This certificate is designed to provide professionals the required understanding and insight into adequately complying with ASC 606 (Topic 606) “Recognize Revenue from Contracts with Customers”. The certificate courses utilize extensive examples to facilitate learning and allow the professional to practice their skills related to the five-step model. There are six separate courses that are specifically dedicated to practicing your knowledge and applying it to case scenarios specific to each step. At the surface, the five steps seem simplistic. However, there are many considerations that should be considered within each step based on your process and industry. Transaction and industry specific revenue recognition guidance is eliminated. It is replaced with a principle-based approach for determining revenue recognition. The new standard requires significantly more disclosure than previous generally accepted accounting principles (GAAP). •Most financial instruments and guarantees (other than product or service warranties). Lynn Fountain is a past Chief Audit Executive and subject matter expert in the field of ethics, compliance and controls. Her career has been highlighted by her focus and accomplishments in the fields of internal controls and internal audit and ethics. Ms. Fountain has authored three separate technical publications that speak to difficult concepts and ethical scenarios that are experienced in today’s working world. Those publications include: “Raise the Red Flag – The Internal Auditors Guide to Fraud Evaluations,” “Leading the Internal Audit Function,” and “Ethics and The Internal Auditor’s Political Dilemma.” Ms. Fountain has instructed thousands of professionals on the concepts of ethics and compliance and is highly regarded as a subject matter expert in the field. Her thoughts and concepts have been featured in technical publications and leading practice magazines. This course is a continuation of discussion over Step One in the revenue recognition process of Identify the Contract. This course further evaluates areas that impact performance obligations. This course is designed to evaluate Step Three of the new model dealing with Determining the Transaction Price. This course is the second part in a two-part segment that evaluates the various concepts involved in determining the contract price. This course is designed to evaluate Step Four of the new model dealing with allocating the transaction price. This course is dedicated to Step One of the new revenue recognition model “Identify the Contract”. This course is dedicated to Step Two of the revenue recognition model “Identify Performance Obligations”. This course is dedicated to Step Three of the revenue recognition model “Determine the Transaction Price”. This course is dedicated to the evaluation of case scenarios related to Step Four and Five of the revenue recognition model. This course briefly outlines each of the five steps and then works through various exercises and scenarios covering each of the steps. Requirements: There are no prerequisites required for this certificate. Testing: Unlimited online attempts of exams at end of each course. Must pass each course with a score of 70% or better to receive certification. Tests are online and not proctored. Why should I be Illumeo Certified? In short, you would do this to get better at what you already do, or to get a significant knowledge jump on something you want to do for a living. And, via the certificate itself, to be able to show others that you have attained this knowledge. Why should I hire a Professional with an Illumeo Certification? You would hire this Professional because they bring deep knowledge, on concrete topics, to your team. Simply completing the Illumeo certification denotes that the person is a serious professional willing to take the time to become very good at what they do, and that they put in the time, passed the tests, and are knowledgeable in their area of certification. There is an exam for every course and you must pass every one in order to receive your certification. You may re-study the content and re-take any exam until you pass it. Why would I want a subscription on Illumeo? 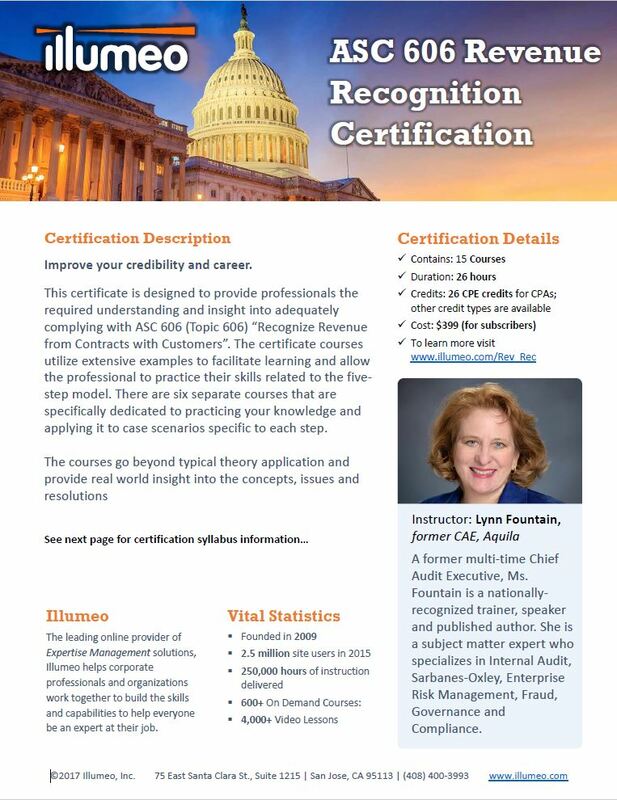 A subscription to Illumeo helps fill out your professional knowledge with its unfettered access to hundreds of up-to-date on demand courses taught by long-time practitioners - just like the instructor of this certification program.